Kitty Hawk, a start up backed by Page that works in the field of aerial mobility invited prospective buyers to take their latest flying car 'Flyer' for a spin this Wednesday. Google co-founder Larry Page has been invested in making flying cars a reality and it almost happened this Wednesday. Kitty Hawk, a start up backed by Page that works in the field of aerial mobility invited prospective buyers to take their latest flying car 'Flyer' for a spin this Wednesday. What's more is that the company claims that anybody can learn how to fly this vehicle in the span of one hour. Kitty Hawk called interested buyers for a test flight at Lake Las Vegas in Las Vegas without quoting a price. 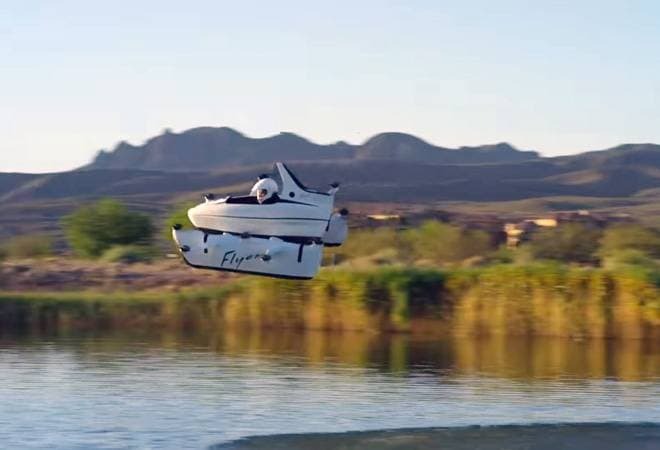 "Making Flyer accessible, which is what we do at our Lake Las Vegas training facility, helps more people experience the freedom and possibilities of vehicles of the future," a Kitty Hawk spokeswoman was quoted by AFP. Kitty Hawk, which was founded in Google's hometown Mountain View, California, has been conducting test flights in New Zealand, the AFP report said. The company first came out with their Flyer prototype in 2017 and spent the last year refining the flying car. And the results are showing. While the prototype was merely a quadcopter with a seat, the Flyer seen at Lake Las Vegas comes closer to looking like an actual vehicle. It has a small open cockpit that seats one. It is controlled by two joysticks it just hovers in air when moving forward or back. While this not a definitive break in making flying a commonplace means of transport, it sure opens up new avenues. With other companies like Uber also toiling to make this a reality, we could expect some concrete progress in days to come.